How many times have I said that I love making Chinese food at home? So much better than ordering in. I made three batches to test out how much tamari to put on the vegetables inside the wonton wrappers (none, some, a lot) and my final recipe is some. And of course, no egg roll is complete without the duck sauce. I did some research and it’s a combo of sweet and tangy. Actually, I kept making the egg rolls just to dip into the duck sauce! Mix all ingredients and heat up over high heat. Cook until it thickens and reduces somewhat. Chill until ready to use. Chop the cabbage and saute in sunflower oil. Add the carrots and keep cooking. Add the snow peas. Whisk together the tamari and cornstarch. Add to the vegetables and mix well. To make the egg rolls, set the wonton wrapper down in front of you so it is in a diamond shape. Brush water around the edges and place a scoop of the mixture in the bottom corner. Roll it once and then tuck in each side. Keep rolling until done. Heat up about 16oz of oil until super hot. Slide 3 rolls at a time into the hot oil using a spider strainer. Let them slowly roll off and start to cook, moving them around so they don’t stick, and then let them cook. Turn the rolls if necessary and when they are done, drain them on a paper towel until ready to serve. As the oil gets used, the rolls get done faster and get more crispy. Dip, I mean double dip (! ), into the duck sauce and enjoy! Just saw this on Pinterest and had to click through to see if it was "real" duck sauce. I grew up in new england and fondly remember it- since then I've lived in CA and CO and haven't had it in either place. I'll be trying this for sure!! yeah! it is delicious and so easy to make. let me know how it goes. Hi Lisa, just wondering if you know how long this will keep in the fridge? I’m afraid to make too much if it doesn’t last more than a few days. hi! the duck sauce will last at least a week, if not more. the filling will be good for a few days. 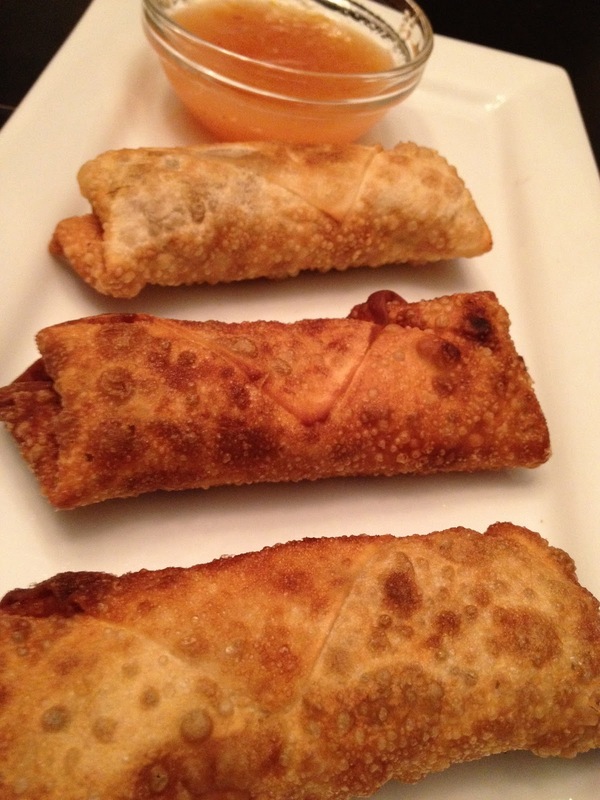 fry the egg rolls the day you are serving that way they are hot and crisp! but like with all chinese food, they will be great the next day, heated up in the oven. thanks! Do you keep the duck sauce in the fridge all the time? Do you heat it up at all before using it? Do you warm up the duck sauce as you need it or just use it cold? I made this for my husband to use at home with veggies and rice. yes, i do keep it in the refrigerator but i let it come to room temperature before serving! Where do you find vegan wrappers? i found some at foodtown but you really have to look hard. sometimes i find them at kosher supermarkets too.